Panasonic's New KX-TG9382T Landline Phone Tries To Make Itself Relevant With Bluetooth | OhGizmo! By Andrew Liszewski on 09/15/09 • Leave a comment! I know, a lot of you have probably given up your landline phone in favor of just using a cellphone, but those of you who haven’t will be happy to hear that traditional phones are getting a bit more useful. 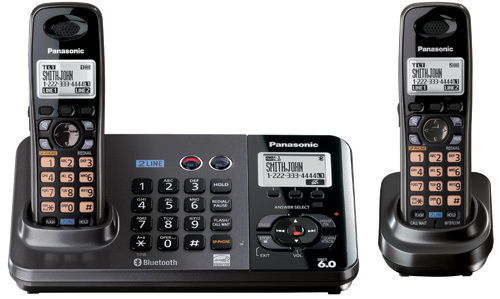 Panasonic’s new KX-TG9382T two-line phone for example comes with Bluetooth which not only allows you to use it with a Bluetooth headset for handsfree operation, but also allows you to wirelessly transfer up to 600 contacts from a Bluetooth equipped cellphone to its own phonebook directory. It also features a 40-minute digital answering machine so you don’t have to pay for voicemail, three-line conferencing capabilities and a Silent Mode allowing you to turn off the ringer at preset times of day, like when you’re trying to sleep at night. $169.95 for a single handset unit and $229.95 for a double.